The name Sallagh is recorded in Toponomia Hiberniae by Breandán Ó Cíobháin. Caora Bhán is the 362nd highest place in Ireland. Picture from simon3 : Twisting ridge, Sallagh to the centre with Beann Far SW behind. Picture: Twisting ridge, Sallagh to the centre with Beann Far SW behind. 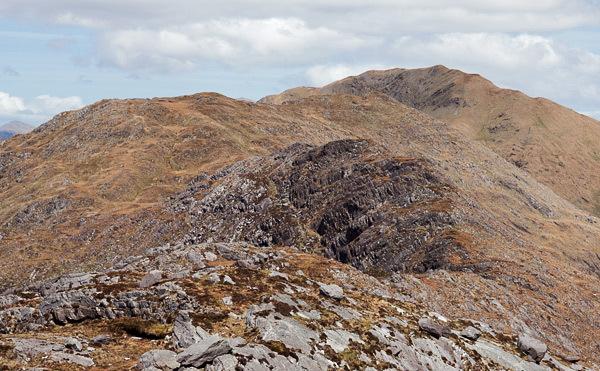 If you like your ridges narrow and steep then you you'll like the 1300m trip from Finnararagh/ An Corrán to this place. As with so much of this area there are large boulders strewn around often perching at odd angles from when the ice left. The land and the top is steep on both sides. At times the ridge seems to follow the top of an upward fold in the land, which you can see in the picture.